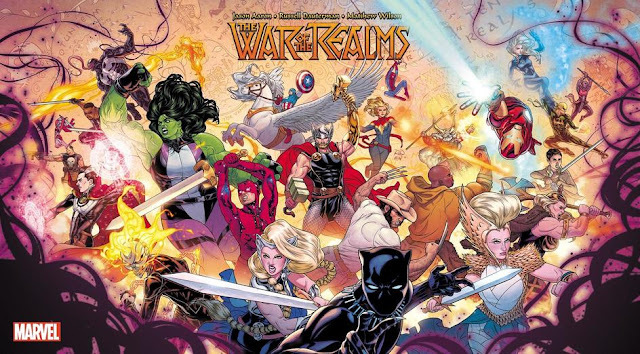 Back Issue Ben: Guarding the Galaxy, Part 12: Conquest! Previously, a technological race called the Phalanx have taken over the Kree empire, enslaved the minds of the Kree people, and cut off that section of space from the rest of the galaxy. Former heroes and allies have already been enslaved to the Phalanx cause by the transmode virus, becoming members of their elite Select. 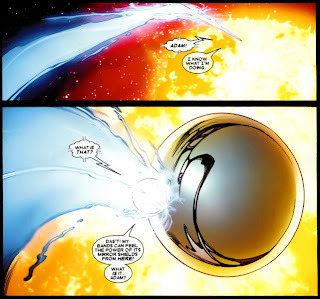 Quasar was contacted by the spirit of the Supreme Intelligence, who led her and Moondragon to the location of Adam Warlock. The mysterious Wraith has the ability to immobilize the Phalanx, and carries the soul of the Supreme Intelligence within his costume. Allied with Ronan and the Super-Skrull, they have joined an underground resistance force. 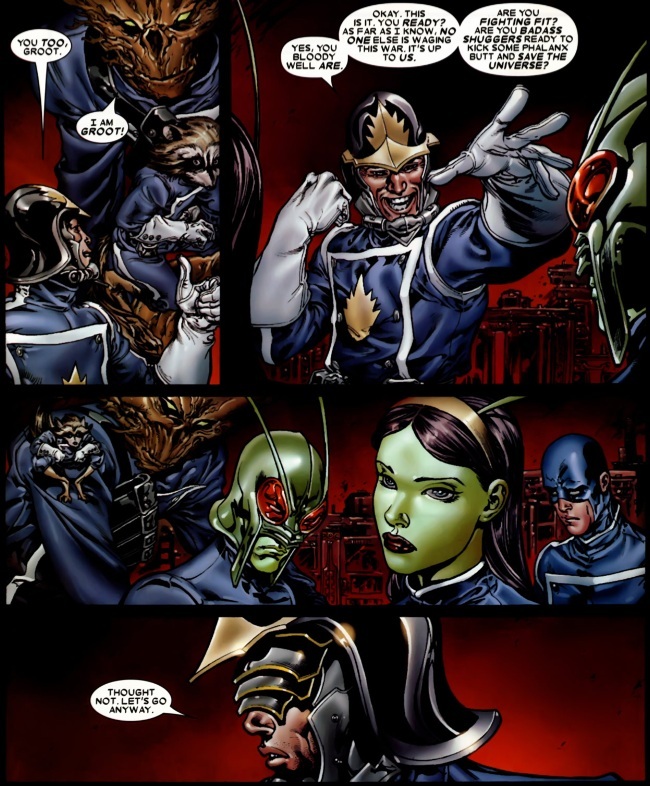 Starlord was restored and recruited by the Kree to conduct covert missions against the Phalanx with a hand-selected team of misfits, consisting of Groot, Rocket Raccoon, Mantis, Bug, and (former Captain Universe) Gabe. Nova, infected with the transmode virus, made his way to Kvch, the homeworld of the Technarchy, the species the Phalanx were spawned from. 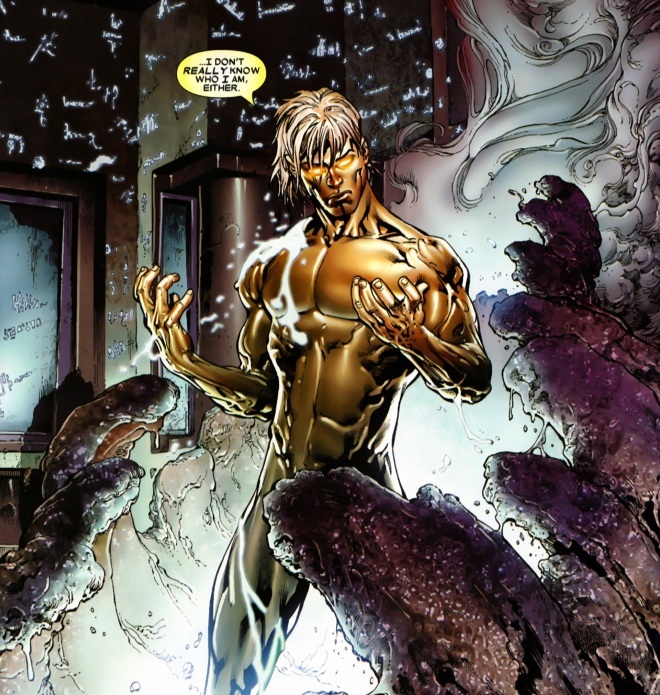 With the help of Warlock of the New Mutants, he was able to cure himself, Gamora, and Drax of Phalanx infection. We’ve made it to the big event, let’s get right into it. 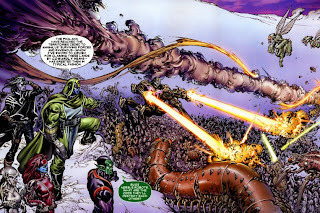 Blastaar leads a small commando unit of Kree soldiers against the Phalanx. 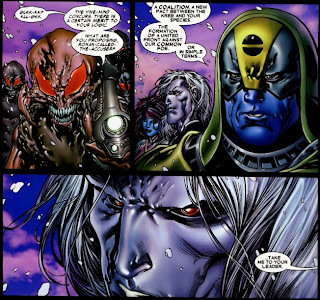 They are slaughtered easily, and Blastaar is captured. 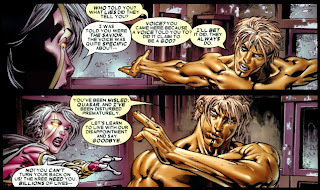 The new Quasar, Phyla-Vell, recaps the current situation to a recently reborn Adam Warlock. 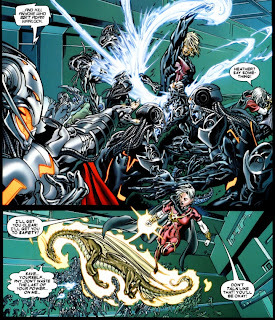 (The Phalanx are converting some of the Kree people into energy to fuel their machines. Adam has no memory of his former life. Moondragon uses her telepathic powers to share some of her memories, but it only partially works. He remembers that he had come there to heal himself, to block out the billions of souls crying out in pain inside his head (from the previous Annihilation War), but he was woken up before he had fully healed. 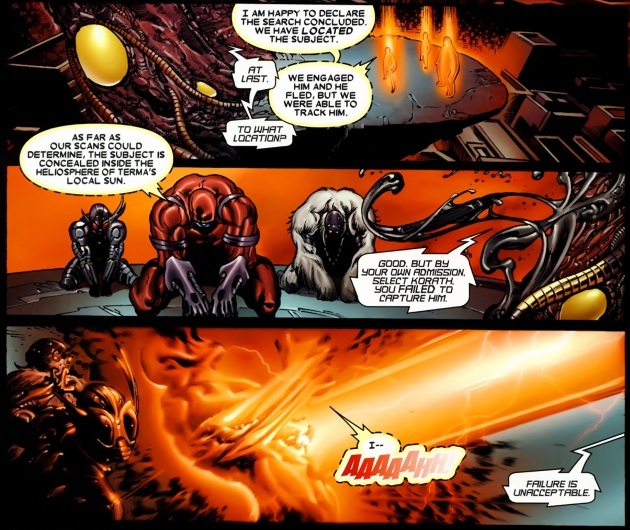 Quasar tries to convince him that, according to the Supreme Intelligence, he will be their savior, but he has no interest in helping. Energy explodes all around Warlock, causing him extreme pain. Immediately after that, a battalion of Phalanx soldiers teleport in. 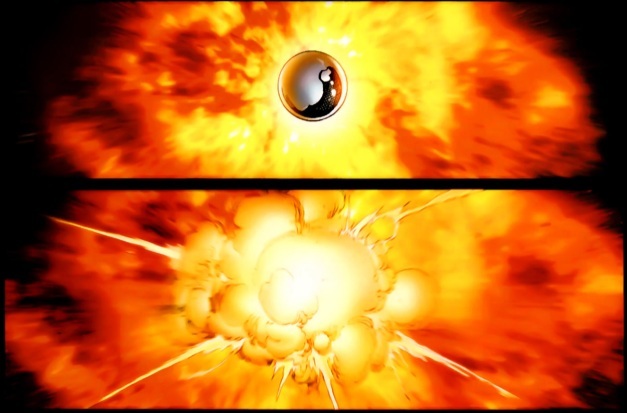 Adam Warlock scoops up Phyla and Moondragon in a ball of energy and transports them out into space. He heads for a strange metal sphere which he calls the Refuge, orbiting closely around the local sun. Meanwhile, Ronan leads the Super-Skrull, Wraith, and Ra-Venn into the Kree territory ceded to Ravenous and his army of Negative Zone bugs. They are not greeted warmly, as their ship is shot out of the sky as soon as it is within range. 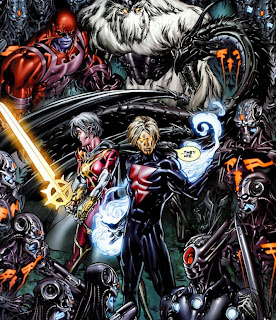 Adam Warlock and the others enter the Refuge. 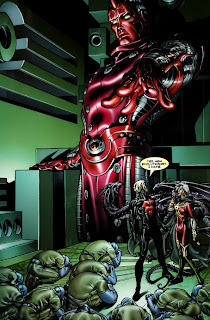 Inside, Phyla and Moondragon discover it is the home of the High Evolutionary. Back on Hala, at the Phalanx Command Center, the Select warriors picked to locate and capture Adam Warlock address an unseen entity about their failure to apprehend Adam Warlock. 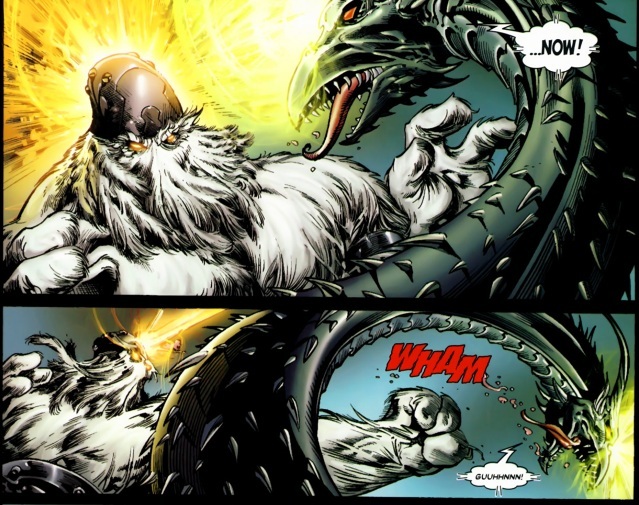 Korath is terminated for this failure. Afterwards, the mighty Ultron stands revealed. 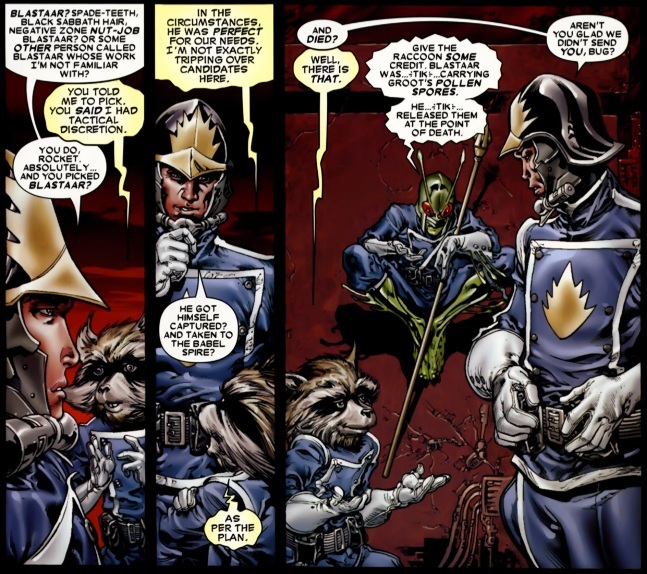 The Phalanx interrogate Blastaar, but he refuses to give up any information. He eventually dies on the interrogation table having revealed nothing. 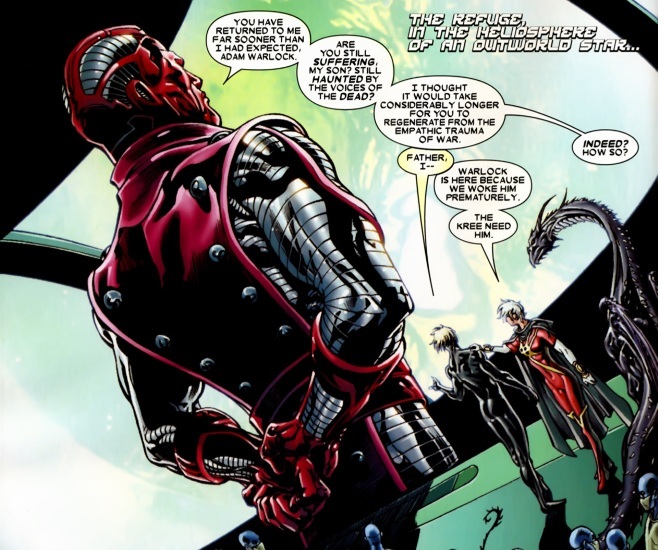 On the Refuge, the High Evolutionary is surprised to see Adam Warlock has returned so soon, while Moondragon and Quasar try to convince him to assist them against the Phalanx. Ronan and his team survived the attack and made it safely to the surface, where they find the Negative Zone bugs locked in combat against the Phalanx. Wraith immobilizes the Phalanx, and Ronan talks with the bugs about having a meeting with Ravenous. On Hala, Starlord returns from a covert mission to meet with the rest of his team (Gabe, Mantis, Bug, Groot, and Rocket Raccoon). 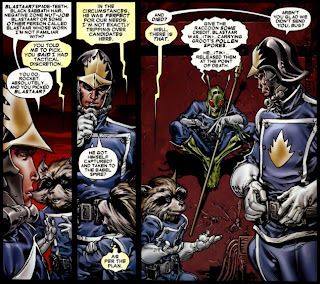 The team had sent Blastaar in to get captured, so that he would release some of Groot’s pollen spores upon his death. The spores expand out, filling every crevice of the tower. Mantis uses her biopathy powers to make a virtual map of the tower using the spores. They need to work quick though, as Blastaar will recover from his seeming death soon, and surely be turned into one of the Phalanx’s Select. Now with a good map of the target, Starlord and his team prepare to execute the next phase of their plan. The High Evolutionary examines Adam Warlock. He confirms that he was woken too soon, and that the new powers he is developing haven’t had time to coalesce, causing the seizures. Once they have finished, they will be easier to control. With that finished, the High Evolutionary shows them what else he had been working on. Before the war, the Supreme Intelligence had commissioned him to create a new master race of the Kree. When the war began, he had obviously lost contact with the Kree. He had initially believed them to be representatives of the Kree, come to collect. Now with the Phalanx in control, the High Evolutionary could manufacture Kree warriors to combat them, but in return, he wants safe passage out of Kree space. As powerful as he is, he is still a biological being, and could be assimilated by the Phalanx. Warlock senses an incoming teleport, right before Ultron and a squad of Phalanx warriors arrive. 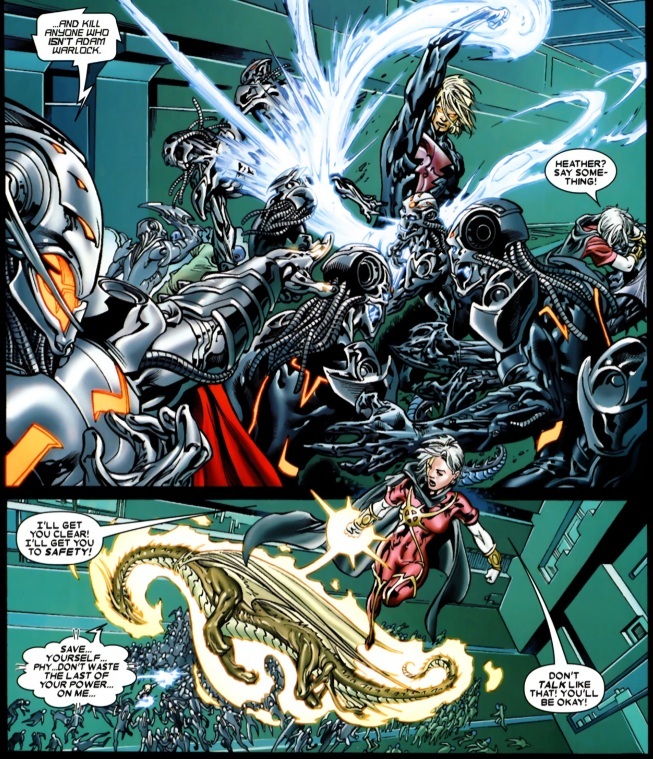 Quasar moves toward Ultron, but Moondragon steps in between them. 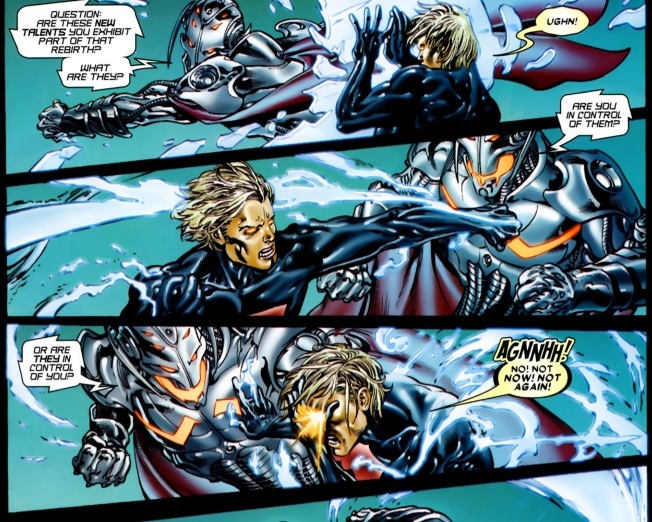 Ultron rams his arm straight through Moondragon’s torso. Adam is tearing apart the Phalanx soldiers with his new powers. 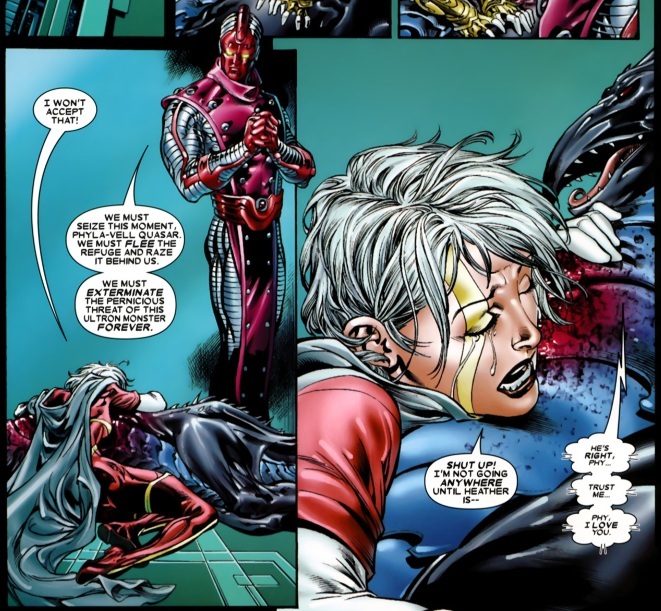 Phyla pulls the injured Moondragon away from the fray. High Evolutionary teleports away, leaving Adam alone against the horde. 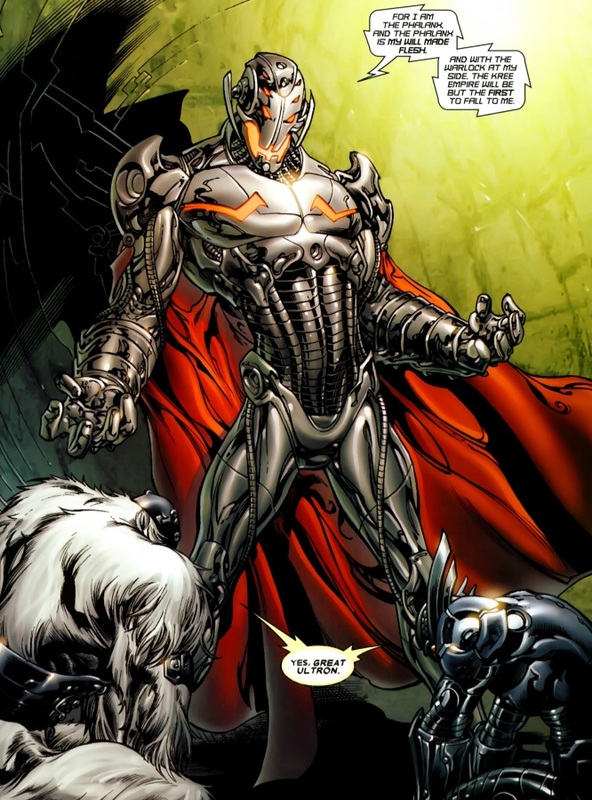 Ultron orders his soldiers aside, so that he can face Adam one-on-one. 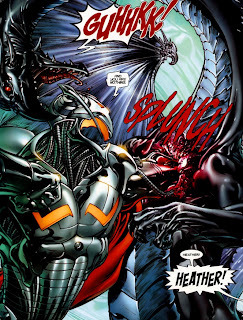 Away from the action, Phyla begs the High Evolutionary to fix Moondragon. He cannot. Phyla tearfully says goodbye as Moondragon passes away. 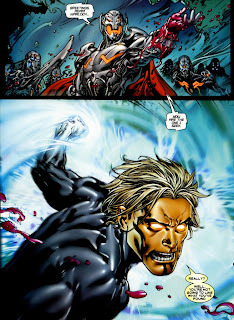 Phyla, full of rage and grief, rushes toward Ultron. High Evolutionary, sensing things are falling apart, mentally confers with Adam Warlock. He plans to enact his emergency scenario, initiating a terminal reaction in the nuclear heart of the nearby sun.Adam objects, but not in time to save the Refuge from exploding. In Ravenous’ throne room, Ronan proposes they unite to combat the Phalanx threat. 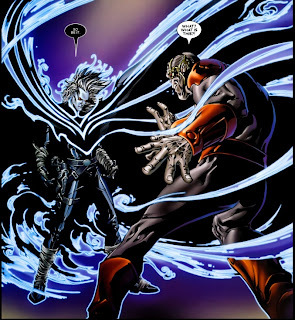 As Ravenous gloats over the perceived weakness of his enemies, Ronan orders Wraith to use his powers. 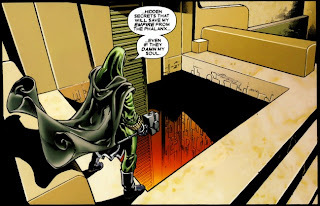 With the bugs frozen in place, and Ravenous put in restraints, Ronan reveals the real reason for them being there, the secret compartment hidden beneath the throne. At the Babel Spire, Starlord and the others work quickly to plant explosive charges throughout the facility. 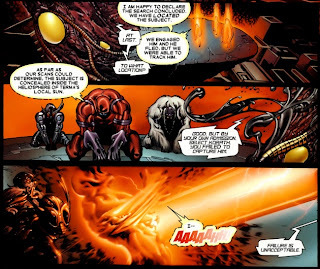 They are interrupted by Blastaar, now a Select. 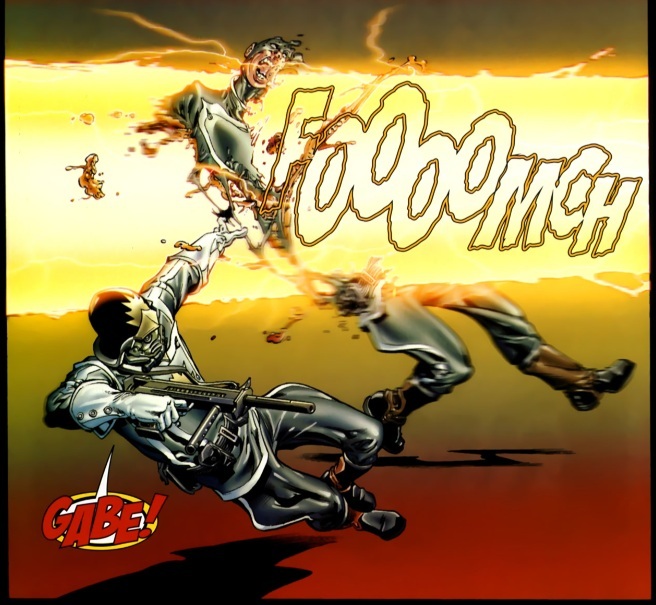 Starlord and Gabe fire away with their weapons, but Gabe perishes in the battle. 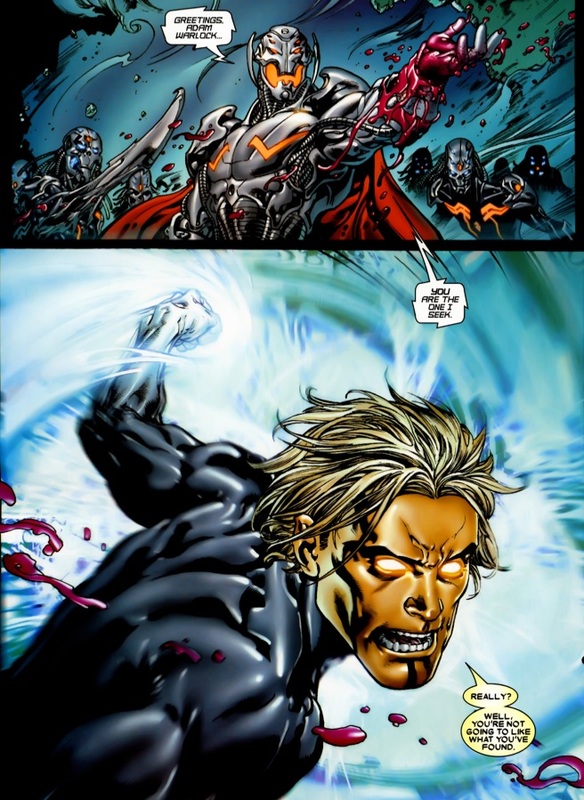 Blastaar neutralizes Starlord. 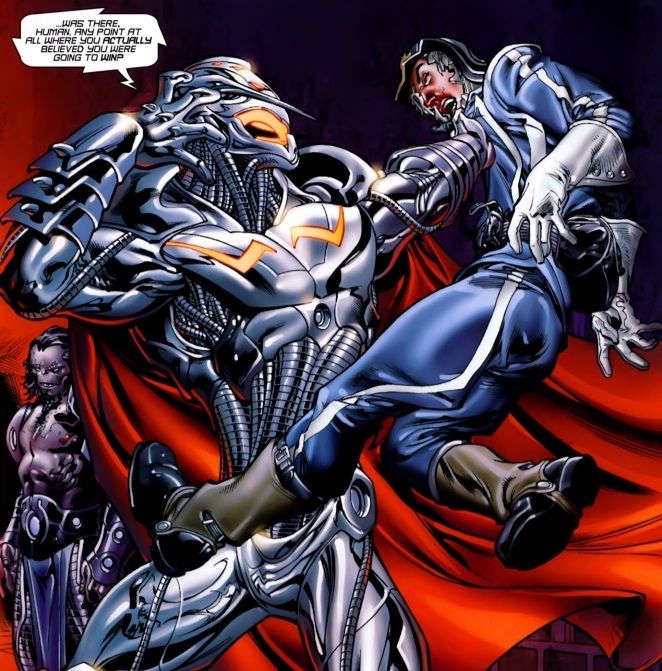 While he lays there on the ground, Ultron arrives, having escaped the nuclear explosion by downloading himself into another body. Ultron lifts Starlord up off the ground, and asks him how they thought they could ever win this war. My final brain thoughts: Zombie Terry Long, dead dragons, dead Gabe, luminescent tree spores, zombie Blastaar, and (insert insult) Marv Wolfman. That’s it for this week faithful reader. Come back next week for the exciting conclusion! !